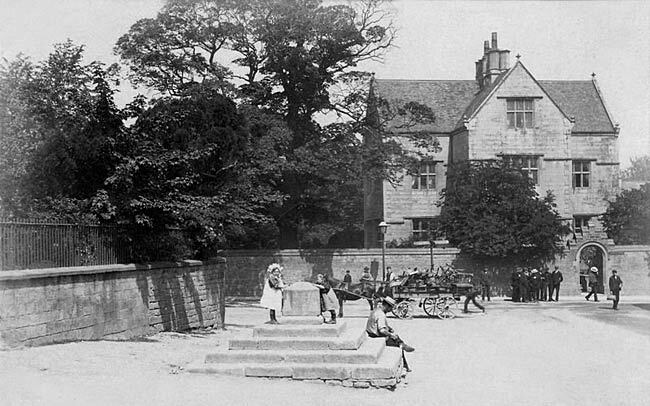 The market cross, Mansfield Woodhouse, c.1905. MANSFIELD WOODHOUSE. Mining, quarrying, and building have made their mark on this village on the border of the Forest, where land was held six centuries ago for the service of blowing a horn to drive the wolves away; but something of the old days is left in the church, and in the great steps and base of the cross on the road leading to it. 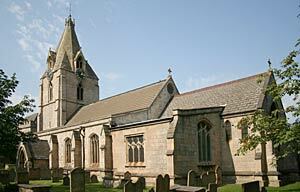 Mansfield Woodhouse church in 2006. Except for its 13th century base (with a modern west doorway and a window adorned with two fine crowned heads) the beautiful tower and its sturdy spire are 14th century, the spire unusual for its great dormer windows and the tiny ones at the top. The rest of the church was made new last century, and is interesting for its carving in wood and stone. Fine corbel heads of men and women, many of them crowned, adorn the windows and the porch; and among the great gargoyles are grotesques, a lion, and a dragon. On the fine sedilia are small scenes of the Sermon on the Mount, the Resurrection, and the Ascension; and in the arcade capitals of the chancel are flowers and angels. The big stone pulpit is of more interest than its plainness suggests, for it rests on a splendid corbel of Eve holding an apple, the serpent coiled round her arms. There is abundant entertainment in the poppyheads of the bench-ends, which hide from the casual eye a host of tiny figures of animals and humans, full of humour. Among them are two-headed grotesques, an alligator, an eagle killing an adder, a fox jumping up at acorns, and a grotesque face with ears at the top of its head. One has the tiny head of a fox on one side and its tail on the other, as if it is creeping through the poppyhead; another is very quaint with a man at the top, a monkey at one side, and a grotesque animal creeping out from the other side. Two relics of the 17th century are a shield of arms in a window, and a great stone monument with extraordinary standing figures of John Digby and his wife. John has flowing hair and is in armour with a sword, a thick sash of cord hanging from one shoulder; his wife has a quaint contented smile on her pursed lips, and wears a gown with puffed sleeves, flowing headdress, and a handkerchief tied under her chin. In the churchyard, which is like a lawn, is an ancient stone showing the heads of a man with curled hair and a woman in a wimple, each recessed in part of a quatrefoil. It seems to be the upper part of a double coffin stone, and is set on a great stone block.